Grout that’s become chipped or discolored over time needs to be removed. Otherwise, it’s open to harmful bacteria and cleaning it only becomes a tedious chore. Grout removal should also be part of your bathroom renovation or maintenance. You can do this project yourself but it requires dedicated grout removal tools to simplify the process and speed things up. Check out the different tools you’ll need for this project. Owning a rotary tool is going to prove useful when you need to make repairs to your tile. If there is a section of your tile that needs to be removed in order to make repairs, then the rotary tool will be able to help you remove it efficiently. It can help you to remove the grout and you can position it exactly where you need it to go. The fact that this tool is so easy to handle is one of the aspects that makes it so popular. Overall, this rotary tool is a joy to use for many tasks. It feels very lightweight and it won’t be difficult to use it for long periods of time. It’s really compact too, making it a simple tool to take with you to any job location. The size of the tool makes reaching cramped space a lot simpler than it would otherwise be. The model being shown here is a cordless rotary tool. This can be really convenient because you don’t have to worry about a cord being in your way. This rotary tool charges up very fast and the battery lasts for a reasonably long amount of time. You’ll be able to finish your grout removal job without having to worry about encountering any power issues. The one negative of this tool is that it really can kick up a lot of dust. This is sort of to be expected when you are doing grout removal work, but it can be a bit pronounced with this tool. Regardless, this is an excellent tool that you shouldn’t hesitate to add to your collection. It will prove useful to you and can help you to make your small tile repairs a lot easier. 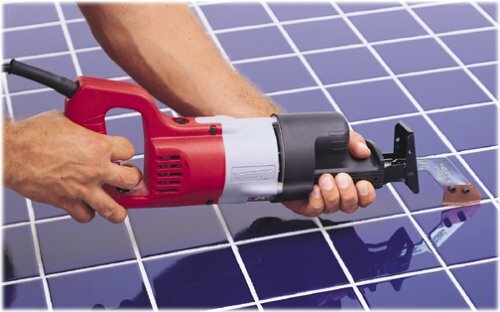 Oscillating multi-tools are among the most common power tools used for grout removal. They are incredibly handy and have several advantages over using a rotary tool. These tools are really powerful and can help you to make grout removal a breeze. They have strong oscillating blades that can cut the amount of time it takes to remove grout down significantly. A large advantage that this tool has over the rotary tool, or even something such as an angle grinder, is that it doesn’t create a lot of dust. Some of the other power tools can be messy when you’re using them for grout removal. The oscillating multi-tool works in such a way that dust isn’t a big problem. This makes it very popular among professionals who want to do their work without leaving a mess for their clients. A high-quality tool such as this is going to cost you a bit of money, though. It can be worth the cost when you are doing a large tile job and you need something to help you complete it swiftly. If you’re on a tight budget, then you may want to turn elsewhere to get tools for grout removal. This is among the best options that you could consider for grout removal, so just consider the price and make your decision based on how strong your needs are. This model here is cordless so it is really convenient to use. It comes with a charging dock that can be plugged right into an electrical outlet. It doesn’t take too long to charge and you will be able to use this for fairly long periods of time after it has reached a full charge. It’s a good tool that will work superbly for grout removal. If you have a large grout removal project on your hands, then you’re probably going to want to purchase an angle grinder. This tool is really useful for tackling those large projects and will allow you to remove grout very efficiently. You can cover a long surface area with this tool and it makes the job go by a lot quicker than something such as a rotary tool. It does have something in common with the rotary tool, though. Much like the rotary tool, an angle grinder can be quite messy to use. If you want to avoid creating a bunch of dust while doing the grout removal job, then the angle grinder isn’t going to be ideal. Most people are fine with putting up with the dust that it kicks up because of how much more convenient an angle grinder is to use. Removing grout is very simple with this powerful tool and it really can cut the time down significantly. It’s also a versatile tool because it can be fitted with different cutting blades. This means that you can change things out if you need to approach something in a different way. Also, the way that you hold an angle grinder feels very natural. It is easy to approach the grout from the perfect angle and cut it away. This tool is going to be pretty noisy and a little bit messy, but it might be worth the hassle that you have to go through. Being able to get your grout removal job completed in a timely fashion is nice. This tool isn’t as pricey as the oscillating multi-tool either, so it can be more appealing from a financial standpoint. You will want to consider purchasing this if you have a large tile installation or removal job to complete. A grout grabber is a convenient attachment for a reciprocating saw. This can make removing grout simple and will allow you to cut away grout very quickly. 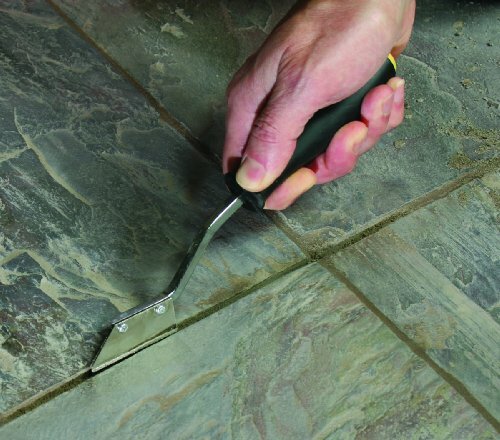 Removing the grout from any joint will be easier when you have this tool available to use. You’ll be able to fit it in exactly where it needs to go and the process won’t take long at all. This is also a good way to remove grout without making a huge mess. It is another option that doesn’t create a lot of dust when you’re using it. If you want to remove the grout without having to clean up a bunch of dust afterward, then you’ll love making use of this tool. It’s convenient and simple to use, so it’s hard not to recommend it. One of the problems with this tool is that you need to rely on another power tool to make use of it. If you already own a reciprocating saw, then you will be able to buy this grout grabber attachment without any trepidation. Having to purchase a reciprocating saw just for this purpose may not feel very cost effective, though. You have to take everything into consideration before coming to your ultimate decision. The reciprocating saw is meant to be used in tandem with the grout grabber attachment. This will allow you to tackle your grout removal job and make short work of it. Attaching the grout grabber to your reciprocating saw should be rather simple. It’s an easy process and you’ll be able to get to work in no time. You just need to decide whether or not you want to buy a reciprocating saw. One reason that you may want to consider doing so is that a saw such as this is going to be useful for many different purposes. It’s an excellent tool that will come in handy for many different jobs. If you could use this saw effectively for other reasons, then you could certainly justify making the purchase. It isn’t outrageously expensive or anything either. Even so, this is a significant investment and it isn’t a tool that most people would buy on a whim. If you have a large grout removal project, then buying this saw along with a grout grabber will be helpful. You just have to decide whether or not it is worth the price of admission. The hand grout removal tool is going to be one of the most affordable ways that you can tackle your grout removal project. Using this tool is going to feel really simple because it is designed to be easy to use. You just need to put pressure on the tool itself and dig it into the joint to scrape out the grout. It may not be the most elegant method of grout removal, but it is tried and true nonetheless. If you want to remove grout while staying within a tight budget, then purchasing a hand grout removal tool has some merit. You’ll be able to avoid spending too much money and you can definitely complete the job this way. This is one of the oldest methods of removing grout and it will work well. It won’t be a quick process, though, and you will need to be committed to working on this job for a while. Deciding which route to take may be difficult. The idea of saving money is always very appealing, but knowing that the job is going to be a bit more tedious isn’t necessarily a pleasant thought. You can rely on this tool to do its intended job well. You will be able to get the job done even if it isn’t the easiest process in the world. This is another manual grout removal tool that you can rely on. Purchasing one of these can actually be very beneficial, as it is the perfect tool for removing old grout when you need to make some repairs. The blade of this grout saw is going to fit right where you need it to so that you can remove the grout. You just saw away the old grout and then make the repairs that you need to make. You will find that professionals always keep a grout saw handy. There are going to be times where a grout saw is preferable to a power tool. You won’t have to worry about making a mess when using manual tools and this grout saw will work perfectly for helping you to make small repairs. It’s all about knowing when to use the specific tool that you need to make a task easy. This grout saw here feels comfortable in your hands, making it a breeze to use it. It comes with two heavy duty carbide blades that will work great for removing grout. You can remove grout accurately and effectively with this tool. It’s very affordable too, which makes it even more appealing. Definitely consider adding this tool to your collection. You might feel as if a screwdriver is an odd tool for grout removal, but it is actually one of the most commonly used tools for the job. Most people don’t have special grout removal tools sitting in their toolbox, so they are forced to improvise. You can actually use a screwdriver similarly to how you might use a hand grout removal tool. The idea is essentially the same and it can actually be pretty effective overall. You will want to purchase a flat head screwdriver for this job. You could make some progress with a Phillips head screwdriver, but it simply wouldn’t be as effective. The larger surface area and flat nature of a flat head screwdriver make it the ideal choice. You can buy just about any screwdriver and use it for this job. Of course, this may not be as simple as using many of the other methods that are listed above. This method will be a lot more time consuming than using tools that are specifically meant for grout removal. Even still, if you don’t want to have to spend too much money, then it can be a good alternative. You likely already have a screwdriver at home that you can use and you won’t need to go to the store. The claw hammer is meant to be used in conjunction with the screwdriver. You definitely wouldn’t want to try to use the claw hammer by itself to remove the grout. This would be impractical and overall not very sensible. You can use the claw hammer in order to strike the screwdriver in order to remove the grout more effectively. This is basically a makeshift hammer and chisel method for removing the grout. It works pretty easily and you shouldn’t have trouble removing most grout in this way. If you want to save money by avoiding having to buy special tools, then this is a good method. You almost certainly own a claw hammer already and screwdrivers are very common too. Even if you do need to buy a claw hammer, you will be able to do so at a very affordable price. A high-quality claw hammer can be purchased without having to pay much money at all. The claw hammer being shown here has a fiberglass handle and a durable steel head. This makes it perfect for many jobs and you’ll be able to make use of it for many years. A rubber mallet may actually be preferable to a claw hammer for the purpose of chiseling away grout. The larger surface area of a mallet makes it easier to strike your intended target. You will have a somewhat more difficult time using a claw hammer than you would a mallet for the purpose of striking a chisel. Regardless, some choose to use the claw hammer because they don’t own a rubber mallet. Buying a rubber mallet is very easy and it won’t cost you much money at all. These can be purchased for a small amount of money and will work well for your purposes. The mallet being shown here has a sturdy wooden handle and a rubber head that will work great for striking chisels. If you want to use this manual method to remove grout, then you’ll be able to assemble the proper tools very inexpensively. A chisel is going to be a bit easier to use than a flat head screwdriver would be. The concept of how you are removing the grout is the exact same. You will be striking the chisel with your mallet and removing the grout bit by bit. It can be a bit tedious, but you will be able to get the job done reliably if you have these tools. A chisel is perfect for getting up against the wall and removing stubborn bits of grout. You can purchase chisels in sets or by themselves. Any type of chisel should work fine for this purpose, but this one is a construction chisel. It is meant for general scraping purposes and helping people to remove things. This will be an easy tool for you to make use of and you’ll enjoy having it around. There are many other types of chisels on the market as well. You will find woodworking chisels and mason chisels. The type that you purchase is up to you. If you feel like it would be easier to strike and use a different type of chisel for this job, then you should purchase that one. Buying the chisel that you feel the most comfortable using is going to help the job to go smoother. It’s a good idea to go ahead and wear safety gloves while you are removing grout. Many of the tools that you will be using have the potential to cut your hands if you make any mistakes. For this reason, purchasing a high-quality set of cut-resistant safety gloves is highly recommended. It will allow you to work without having to worry about little mistakes ruining your day. You can work very effectively with a pair of these gloves on. They actually don’t limit the dexterity in your hands so you can feel what you’re doing really well. The reason that some people avoid wearing gloves is that they worry about it slowing down their work. That shouldn’t be a problem with gloves such as these. These gloves are made out of a combination of materials that combine to make a cut-resistant glove that still feels comfortable to wear. This doesn’t feel like you are wearing a steel gauntlet or something else that is cumbersome. It feels like a normal polyester glove of some sort, but it is very durable and safe. This set comes in a pack of five so you will have plenty of extra gloves in case you have help on your grout removal project. It is smart to wear safety goggles while you are doing grout removal work as well. You don’t want to get a bunch of dust in your eyes while you are trying to do the job. When you’re using the power tools, they can kick up a significant amount of dust into the air. If you don’t have the proper protective goggles to wear, then you will wind up having problems. Getting this type of material in your eyes can actually be pretty painful. You will have to stop to go and wash out your eyes and it can really slow down your progress. Wearing the safety goggles will prevent this accident from happening and you can work steadily until the job is completed. The safety goggles are very affordable, so it just makes sense to buy them in order to stay on task. These safety goggles here are very easy to wear and don’t feel too annoying even when you’re wearing them for several hours. They’re impact resistant and can also protect you from chemical splashes. They will come in handy for several other purposes, so they’re definitely worth having around when you are a DIY enthusiast. The adjustable headband will allow them to fit perfectly in your head, so it will be a good experience overall. Having reliable dust masks available to use will also prove to be important. As mentioned above, using power tools to remove grout can kick up a lot of dust. It’s bad to get it in your eyes and it isn’t stuff that you want to breathe in either. If you want to avoid a coughing fit and potentially getting sick, then it’s smart to wear a dust mask while you’re working. These dust masks come in a pack of five. You will have plenty of extras to either use for another time or hand out to anyone who is helping you with this job. They’re very cost effective and can keep you working steadily until the task at hand is finished. You’ll be happy to have one when you see how much dust gets kicked up while using your angle grinder. The gloves here are actually pretty comfortable to wear overall. For the most part, these are no-frills dust masks that just do the job that they are meant for. They are a standard white dust mask that features a contour-fit for your comfort. You may want to buy a more heavy duty mask for larger jobs, but a simple dust mask such as this should work just fine for a grout removal project.